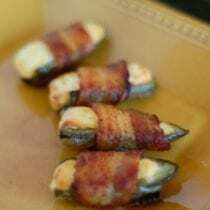 I must be living under a rock because I just recently learned about jalapeno poppers that are wrapped in bacon instead of battered and deep-fried. Some Texan friends (of friends) brought these little treats to a New Year’s Eve party, and I had to force myself to stop eating them so there would be enough for others! Even though I don’t normally go for spicy dishes. Apparently this appetizer is very much a “Texan thing,” and once I got home and “googled” it I realized I must be late to the party. Well I guess it’s better late than never so here’s our version of this recipe…just in time for those upcoming Superbowl parties! Cut the raw bacon in thirds using either a knife or culinary scissors. Using a spoon, fill the jalapeño halves with cream cheese. It’s okay if it gets a little messy. Protect the baking sheet with a piece of foil and place a drying rack or other cooking rack on top of the foil-lined baking sheet. Place the completed jalapeños on the rack so the bacon grease can drain onto the foil. Bake at 375 degrees F for 20 – 25 minutes or until the bacon looks brown and crisp. Special equipment needed: Also need: Drying rack or other metal grate to put on top of baking sheet and aluminum foil to protect the pan. Note: Don’t be afraid to double this recipe for an extra big crowd. I have made these a million times but I have always used turkey bacon! I was just wondering if turkey bacon would be good because I don’t eat pork. Thanks! For those who do not like the heat of the jalepenos, you can try the pepperoncini peppers (in the jar – just rinse) or instead of cream cheese, use a piece of chicken breast to make it more filling. Delicious! These are good cooked on a smoker, which is how my uncle makes them. I may smoke then finish in the oven as sometimes the bacon doesn’t get as crispy as I would like cooked only on the smoker. I just came across your website and am so excited to start the 10 day pledge with my family. The only question I have is that you don’t seem to use a lot of low-fat options. Why do you not recommend them in your recipes? Check out Michael Pollan’s theories on food, one of the inspirations of this blog. Another yummy way is to use pineapple cream cheese. The sweetness of the pineapple works great with the spicy jelepanos! Totally trying this! We had a ton of jalapenos from the garden this summer and I froze most of them, so I’m always looking for new ways to prepare them. I did this with frozen peppers, and it was perfect! Sounds good! I bet my family would love them. I might try turkey bacon, though. Try adding a little of your homemade ranch dressing spice mix to the cream cheese. That’s what I do with mine, and they’re heavenly. Lisa, aren’t these so fab?! YUM. I love them like this, I made a different version this fall. Froze enough for the holidays and still have a few lingering in my freezer. I cut jalepeno’s in half, removed seeds, mixed smoked gouda, organic cream cheese, and crumbled crisped smoked bacon, dash garlic powder. Mixed together and filled each half with this, froze them on a cookie sheet and layered them in ziplocs with saran over each layer. To eat, just thaw a bit, then bake. We found ourselves squabbling over the last ones on the plate. Literally was cutting them so each of us got a last piece. ha ha Thank you for sharing this marvelous snack!! For another alternative, mix diced cooked bacon or chicken sausage for non-pork eaters and garlic powder into the cream cheese. Top with diced sundried tomatoes. You can also add mushrooms instead of bacon for a vegetarian version! If you want to turn up the heat, put all the seeds/insides into one bowl as you are deseeding, then dump out and use bowl (no rinsing!) to mix cream cheese. The oils from the insides stay in the bowl and really give it a kick! Hmmm…sounds like some put another kind of meat (like sausage) in the middle. Maybe something like grits? Not sure! I’ve never used cream cheese in mine… may have to try that! We use jack cheese and stuff the entire jalapeno with that and a medium sized shrimp, wrap it with bacon and grill it. We call it “Fire” and though it’s a labor of love to make, boy is it always a huge hit! I love jalapeno poppers, and when I make them, I add a 4 oz can of diced green chilies, and a small jar of pimentos, both juices and all, to the cream cheese. Then I sprinkle a little bit of chili powder on top. Everyone loves them, and always requests that I make them. For the dairy free alternative, would silken tofu work maybe? Or possibly a little mayonaise mixed with corn or other veggies? Also, these can be made with the red serrano peppers too if you’d like to reduce the heat a little. I love these things too. Here are two links for dairy-free vegan versions of the poppers. They are both breaded rather than wrapped in bacon, but they are baked/broiled rather than fried. The first: http://kblog.lunchboxbunch.com/2011/02/vegan-jalapeno-poppers.html uses a soy cream cheese product, I think there is one made by Tofutti, and vegan “cheese”. The second: http://cadryskitchen.com/2011/11/13/cashew-cheese-stuffed-jalapeno-poppers/ seems a bit more labor-intensive on an already labor-intensive dish, but uses no soy. It makes something called “cashew cheese” to stuff the peppers. It calls for cornstarch, but it is only for the dredging step and I don’t see why that it couldn’t be left out entirely or replaced with WW flour. 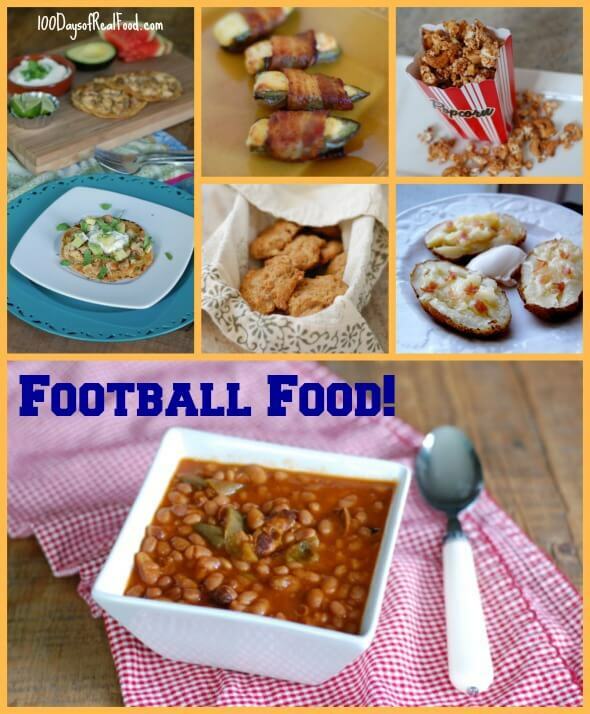 These recipes reminded me that I also enjoy the chedder cheese stuffed version that is breaded. I think they could be baked just as well. Ahhhhh. Poppers and Super Bowl Sunday! Next Up: Jalapeno Popper Grilled Cheese Sandwich! P.S. You could also sub that cornstarch with the whole ground cornMEAL for the breading stage in version 2. I make a breading for my fried green tomatoes that is equal parts buttermilk, cornmeal, and flour and it sticks very well and works out just fine. I think the slight hint of corn flavor with the jalepenos would complement wonderfully. YUM! 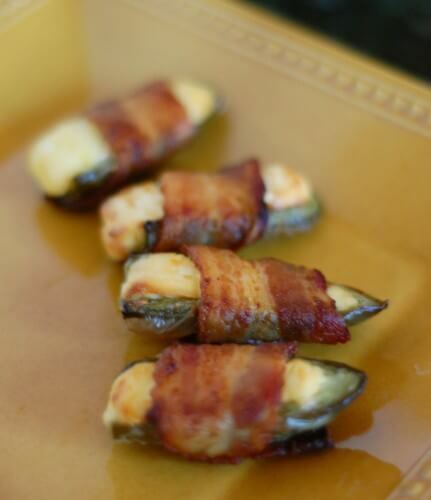 I also recently did some experimenting with jalepeno poppers – adding smoked paprika to the bacon for an alternative. :) I never knew the rest of the country didn’t know about these things. Y’all have been missing out! I guess this is just one of the perks for being a Texas girl. We make ours pretty much the same except we leave the peppers whole and cook them on the grill. We have a homemade rack to stick the peppers in, so the filling doesn’t run out. You can find the racks in stores down here, or you can get one online. You should look up a recipe for Texas Caviar. It requires some minor adjustments with the dressing(it typically calls for zesty italian, but its easy enough to make), but it is amazing!! I made these with fresno peppers and sweet peppers. They are my new favorite party food! So easy, cute, and delicious! WOW, were these easy and AMAZING. THANK YOU for the suggestion – totally awesome, eye-popping deliciousness! I made these last night & they were yummy. I have to make an appetizer tomorrow night & used all my jalepenos by I have 3 bell peppers (green, red and yellow) do u honk I could use then to make this? So glad it was a hit…and yes I think small pieces of bell pepper would work just fine. Hi Lisa! I have been following your site for some time now! My husband and daughters are doing it too, and we all just love your recipes! I have a question though, where do you get your bacon? I just told my husband last week that we could no longer eat bacon because all of the ones I could find (I shop in Whole Foods) have been cured with sugar, either brown or raw. We were going to cure our own with honey… but before I go all the way there I would love to know where you got yours! Thanks! We buy uncured bacon at either our Farmers’ Market or EarthFare (Applegate Organic Brand)…good luck! I buy uncured bacon at Trader Joe’s as well. These are even better brushed with a little barbecue sauce! We make these on the grill in the summer. And I’ve also made jalapeno popper sandwiches that were soooo good! 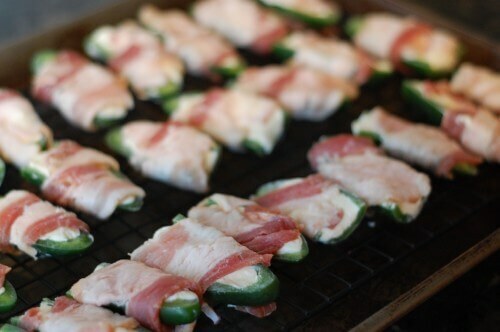 I chopped up some jalapenos and sauteed them, then mixed with softened cream cheese and bacon pieces. Then I spread it on bread and buttered the outside and grilled like you would a grilled cheese sandwich. Yummy! We fix these all of the time during the summer on the grill! I like to add granulated garlic and worcestershire sauce to the cream cheese. They are to die for! Also, if you don’t like them spicy, making sure to scrape the inside of them really well with a spoon and rinsing them with water helps. These freeze great! I make a bunch up ahead of time and freeze them on a sheet tray. When frozen I throw them in a zip lock bag. Then I can just cook what I need. No need to defrost. Question about the rack you cook them on – is this a special oven proof rack or can you use a non-stick cooling rack (all metal)? So I didn’t end up using a rack and it still worked fine. The bacon wasn’t very fatty and I had to cook mine about 10 minutes longer before the bacon crisped (maybe b/c I didn’t use a rack??? I don’t know). I think the extra cooking time made the peppers flatten out/collapse but they still tasted awesome! Sorry for the delay in my response…I just used a cooling rack (pictured). I think it does help with a better outcome. Glad they still tasted good! Add a little crushed pineapple to cream cheese for a sweet and savory flavor. Where do you get organic cream cheese? And what is guar gum that I keep seeing in cream cheese? These are AMAZING grilled, but we highly recommend using something to catch the grease from the bacon and cheese, like foil or a grilling pan if you have one. But when you grill them, the outside of the pepper gets charred a teeny bit, and it’s delicious! Thank you for sharing all your recipes! :) And lunch-packing tips, because us moms need all the help we can get!! Made these last night and couldn’t stop eating them!!! So yummy! Great recipe. The jalepenos I used were a little big. I recommend the smaller ones. I took this to a block party. I love these! We put a slice of grilled chicken and pepper jack cheese in ours though and wrap half slice bacon around. Grill it too. I will have to try it with the cream cheese! I pre-cooked the bacon on a paper towel before hand and drained all the bacon fat. Then put them in the oven they were delicious and crispy! Hi just a note to the alterations I have made with the recipe. After I cut and clean out the seeds I soak mine in a bowl of salt water for 20 to 30 mintues . This cuts the hot for us wimps. I use pecan flavored cream cheese and maple bacon. It gives them a sweet nutty and maple taste that is to die for. It is very easy to make your own pecan flavored cream cheese I just add minced up pecans and raw sugar to taste and blend to mix well. Either way our family loves them …but my way they disappear so quick I have to set mine aside or I don’t get a bite. Yes, these are indeed a Texas staple. I made some last weekend for July 4th. My mom had actually never had them and she normally doesn’t like jalepenos, but she loved these. I had not thought to put them on a rack though. I’ll have to try that next time. Can I freeze theese after they have been cooked? I also make mine with shrimp, crab, finely diced shallots or green onions, and cream cheese. They are delicious!!! Made these, with the pimento cheese recipe, yesterday for my brother in law’s birthday and they were a HUGE hit with both kids and adults. Even my 2 year old gobbled one down. I did have to broil mine on low for a few minutes at the end to get the bacon crispy. Another incredible recipe from 100 Days of Real Food!!! I mix my cream cheese with shredded sharp cheddar prior to filling the jalapeno halves. You can wrap them with bacon and freeze in a single layer OR you can fill the pepper and freeze without the bacon. I had to do this once when my bacon and cream cheese didn’t even out. I’d recommend using parchment paper when freezing so they don’t stick to the pan. Also, you definitely need to bake these on a raised rack, so both sides get crispy!! These are a FAVORITE and whenever I take them anywhere, I NEVER have any to bring any home!! I have made these the last few years BC my jalapeño plants were so prolific that I had tons left after salsa, chili, tacos, etc. They are insanely delicious. You can do easily make them on a pizza stone and save the clean up of a baking sheet. That is how I make mine. Ah! Love poppers! My New Mexico nativeness must protest that this is really a NM thing that the Texans adopted. I guess I’m half/half since I live on the border. My trick to getting the bacon to cook thoroughly is to broil not bake. If you wrap the bacon around really well you can even flip for just a few minutes. The absolute BEST flavor comes from grilling but be ready for a grease fire! I melted a humming bird feeder this way. We have a tasty version here too with shrimp, jalepeno flavored cream cheese, and bacon wrap, then grill or just deep fry for a bit. Mmmm! NM at it’s best! How long and what temp do you bake? In the rare event that you have leftovers, they are delicious sliced up and cooked in scrambled eggs the next morning! I make these on a regular basis and have found that using a grapefruit spoon (it has a serrated tip) to clean the peppers is a quick, easy way to get the membrane and seeds out of the peppers. Love the grapefruit spoon idea! We make these with goat cheese for my daughter who is sensitive to cow dairy. I personally think it is even better than cream cheese, and so does my entire family. I had thought I had invented them until I realized, I too had grown up/currently lived under a rock. Nevertheless…. I love to throw them in the smoker! 250 for about 2 hours, and then finish them in the oven to get a tad crisp. Our grocer now sells them, so I think hey I don’t have to make them! But they are $1 a piece. We’ve been making these for years! The easiest way to stuff the peppers is to let the cream cheese rest at room temp until really squishy. Then I mix in freshly chopped herbs, put it in a ziplock bag, cut off a small corner, and pipe it onto the jalapeños. Easy! My son and I learned the hard way. Don’t rub eyes after touching seeds. Do you think I could use an almond milk “cream cheese”? Yes, that should work, too, though it is not something we’ve tried. Easy to make and came out delicious! I used an air fryer 375 degrees for 15 minutes. We have also been making these with the little mini sweet peppers and mixing in a bit of shredded cheddar cheese! YES on the gloves.. I knew about not rubbing your eyes… but I peeled a bunch of roasted Jalapenos one time without them.. and my hands burned for hours… not fun….